At the Sheffield University Drama Studio this Wednesday 9 March, Vincent Gambini‘s This is not a magic show. 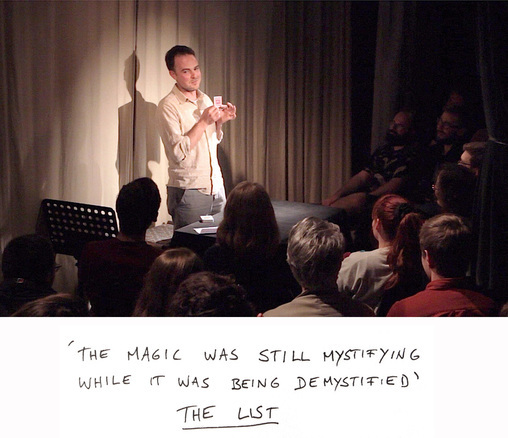 This is not a magic show is a performance of and about sleight-of-hand magic: its invisible mechanics, its clichés, and what it tells us about live theatre and make-believe. In a conversational yet crafted approach, Gambini presents astonishing close-up magic that invites us to question how enchantment and wonder are produced within a theatrical situation. Possibly the first of its kind, the show is part performance-lecture, part deconstructed showbiz, and part magic tricks. Gabini is touring the show throughout the UK. Check here for more dates.. Think these should be on the booking link I gave.